gloCOM Business Edition brings more power, flexibility and efficiency for businesses and corporate clients. It provides advanced Unified Communications experience with all the communication tools that a business could need or wish for. Virtually instant deployment and user friendly GUI will make you love gloCOM. 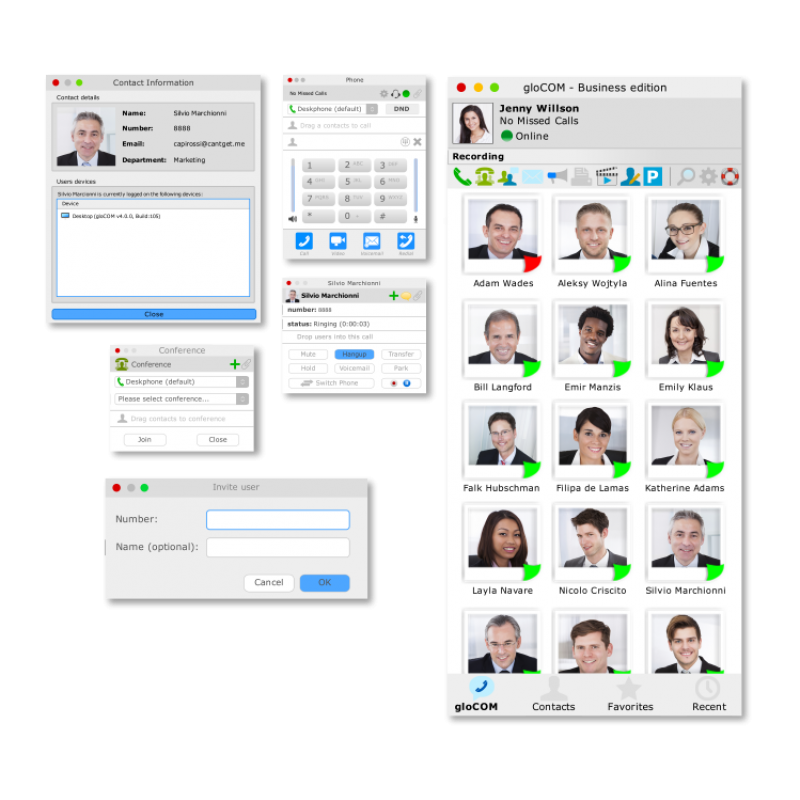 gloCOM Business Edition is a unified communications tool of immense capabilities. You may finally rely on a single application to handle your entire day-to-day communication. We made you a cocktail of high quality Voice and Video calls, Conferencing (Static and Dynamic), Instant messaging, faxing, file sharing, CRM integration, Outlook integration, and a couple of secret ingredients. Sit back and enjoy a successful day! Design of the gloCOM SoftPhone provides a dialpad similar to a standard VoIP desk phone, with slightly improved layout and functionality. The wide variety of features and actions provided by SoftPhone are perfectly suited to modern, computerized communication. Your desk phone is simply not needed anymore. Manage all aspects of your calls visually. No more hassle over dialing a number published on a web page or contained in an email. Access your voicemail inbox instantly and transfer calls directly to desired extensions. With gloCOM everything is simple as a click. gloCOM allows a user to use all unified comms and standard comms features. Create and control dynamic conference calls on any SIP phone or SoftPhone. Convert two way calls into conference call, and add as many participants (dynamic conferencing). Use drag & drop to easily add a third person into your phone call conversation. The added person receives a call and upon answering the will join the conference call. You can add as many other users you want.